When there’s a bit of sun who doesn’t love a picnic!? An outdoor picnic blanket can be used in the garden, park or beach and it folds up nice and neat when you’re not using it. It’s a great cheap alternative to a garden picnic table, plus it barely takes up any room in storage. Another option could be to buy a picnic basket set that includes a picnic blanket, however the size is usually a lot smaller than the ones we’ve reviewed. Our best picnic blankets are of much higher quality than the ones you get in a hamper basket set. Without further ado, we’re going to jump right into it. You can see our guidelines on choosing the best picnic blankets by clicking here or scrolling past the reviews below. Durable acrylic surface with soft ample sponge padding. Waterproof and sand proof backing making it suitable for the park or beach. Can comfortably fit 4-6 people. Large size 200cm x 200cm. Lightweight and compact when folded up. 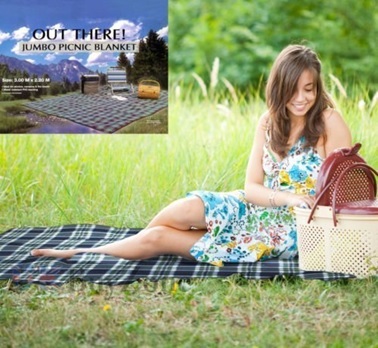 Whether you’re at home in your garden, at the park or on the beach, this portable waterproof backed picnic blanket can be taken anywhere with you. Its aluminium coated backing means the water from damp grass won’t soak into the fabric nor will the sand from the beach stick onto the fabric. Tear resistant acrylic surface with sponge padding. Waterproof aluminium coated backing making it even suitable for damp grass. Once folded up, measures 38 x 25 x 10cm and only weighs 500g. 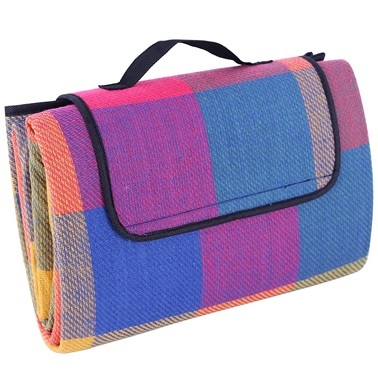 Grab yourself a bargain with this waterproof picnic blanket which can be used for 2-4 people. Buying two works out roughly the same price as a picnic blanket that measures 200 x 200cm, but if you put two of these together you’ll have jumbo picnic rug measuring 195 x 300cm! 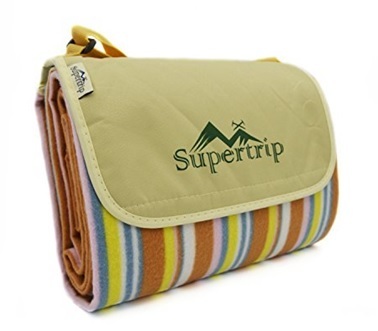 Compact pocket size blanket suitable for picnics, camping, beach, festivals or garden use. Full size measures a generous 160 x 109cm. Folds up to fit into a tiny pouch measuring 12 x 9cm. Water repellent material which can be easily cleaned and dried. 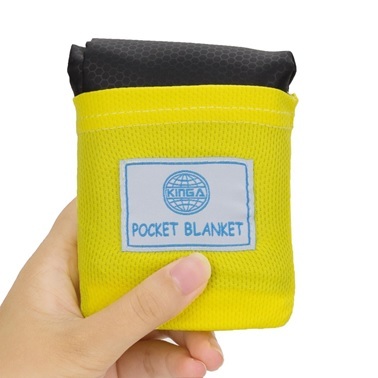 Save space by packing this pocket size thin but durable picnic blanket into your backpack or even pocket! Despite its compact size when folded up in its 12 x 9cm pouch, it can still pack a punch and sit up to 4 people. 10cm thick padded soft fleece to offer great comfortability when sitting on it. PVC film backing to insulate heat and keep it dry underneath. Full size measuring 198 x 145cm, big enough to fit up to 4 people. Folded size measures a compact 30 x 23 x 10cm. Adjustable carrying strap when folded up which can be conveniently carried over your shoulder. When you have too many things to carry for your long awaited picnic just sling this picnic rug over your shoulder with its adjustable carry strap. This colourful rug is perfect for outdoor activities as well as home use for just sitting on if you have hard flooring. Extra large picnic blanket measuring 300 x 220cm. Large enough for a big family, can comfortably fit 6-8 people. Backing made from polyethylene vinyl to prevent any dampness. Ideal for camping, picnics, travelling or garden use. Comes in assorted colours which will be randomly sent. If you’re not bothered about the look of your outdoor blanket then this jumbo sized one is large enough to fit up to 8 people so would be perfect for large groups. 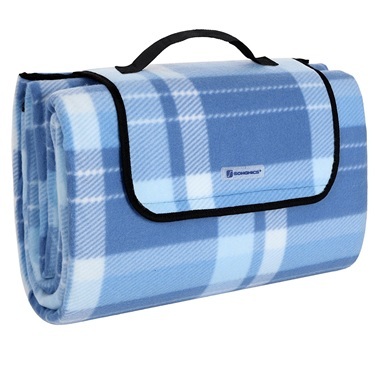 Doesn’t fold up as neat and compact as other outdoor blankets but if you were planning just to put it in a bag or your car boot anyway, that shouldn’t be a problem.